Drei Augen (Three Eyes) :: Oracibo.com - Food, Travel, Design and Cooking! 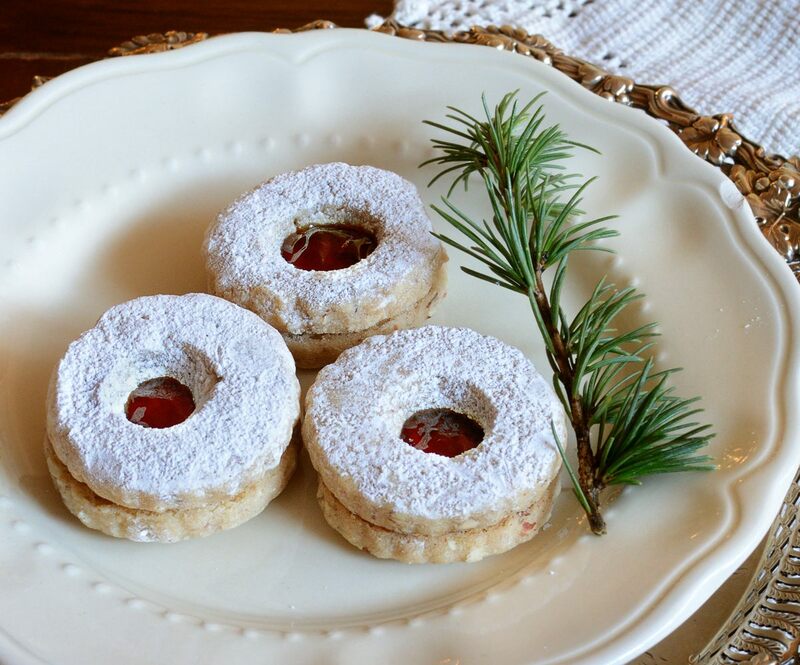 I wasn’t going to put this recipe for German shortbread on Oracibo for some reason or the other…but after receiving rave reviews all Christmas Season…I think I should! This is only the second time I have made them; the first time was back in the mists of time…I won’t wait that long again! The recipe for these absolutely wonderful little currant jelly filled beauties comes from the late Carol Field. I was unable to find my pastry tip for the 3 holes and I had just cleaned out all the kitchen cabinets and tossed all the straws, so no 3 holes just one larger one! It did not affect the taste! I just told everyone they were non-Linzer cookies! Don’t wait until next Christmas to bake up a batch! Either cream the butter in a stand mixer or use a hand-held mixer. Gradually beat in the sugar. Stir in the flour, nuts & cinnamon. Divide dough in half. Roll each piece between waxed or baking parchment to a thickness of 1/8”. Leave on the paper & place on baking sheets & place in the fridge until firm, at least 4 hours or overnight. Preheat the oven to 325 F. Line two baking sheets with baking parchment. Remove 1 piece of dough from the fridge & carefully peel the paper from the top. Cut dough into 1 ½” circles. In half of the circles cut out 3 small holes (an inverted pastry tip works well or a plastic straw). Repeat cutting the circles the same way, cutting the 3 holes in half of them. Place all the circles on prepared baking sheets & bake about 15 minutes. Don’t let the cookies brown too much, although the ground nuts will naturally colour them somewhat. Cool the cookies on the baking sheets for a minute, then very carefully transfer to a rack & cool completely. Dust cookies with holes generously with powdered sugar. Spread about ½ tsp. jelly over each solid cookie. Carefully top jellied cookie with a sugared one. If you have any leftover dough you can roll it into a cylinder, wrap & chilled it; then slice 1/8” thick & bake as above.